Galette is a French term for an open, free-form, rustic tart. It’s a perfect summer treat to use and display the beautiful fruits of summer in a totally delicious way. The pastry crust in a galette can take many forms, but one of my favorite ways to build a galette is with a sheet of puff pastry. Who doesn’t love puff pastry? I sometimes make my own, but 9 times out of 10 I take the easy way out and buy pre-made sheets at the grocery store. Good old puff pastry makes it so easy to assemble an impressive looking dessert in double quick time and with minimal effort. I’m one home cook who ADORES puff pastry. 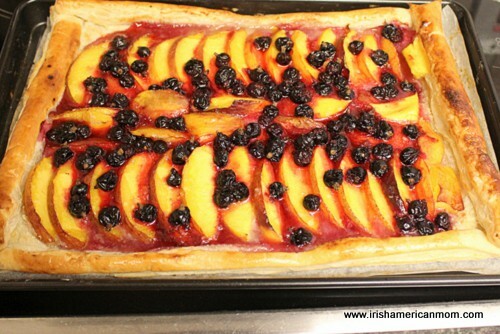 Last summer when I was home in Ireland I baked a puff pastry nectarine and blackcurrant galette. My sister grew an abundant crop of blackcurrants so I needed to create a recipe to use them up in a tasty way. I didn’t share this recipe last year when I discovered the reason why blackcurrants are so hard to find in the United States. But then I realized this tart will be just as scrumptious if made with blueberries instead of blackcurrants, so I decided to go ahead and share it. 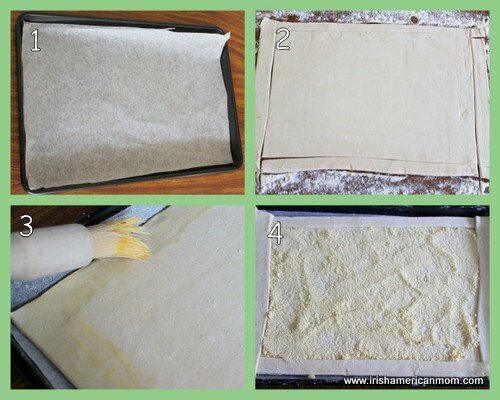 Defrost the puff pastry sheet per package instructions. This usually takes about 45 minutes at room temperature. 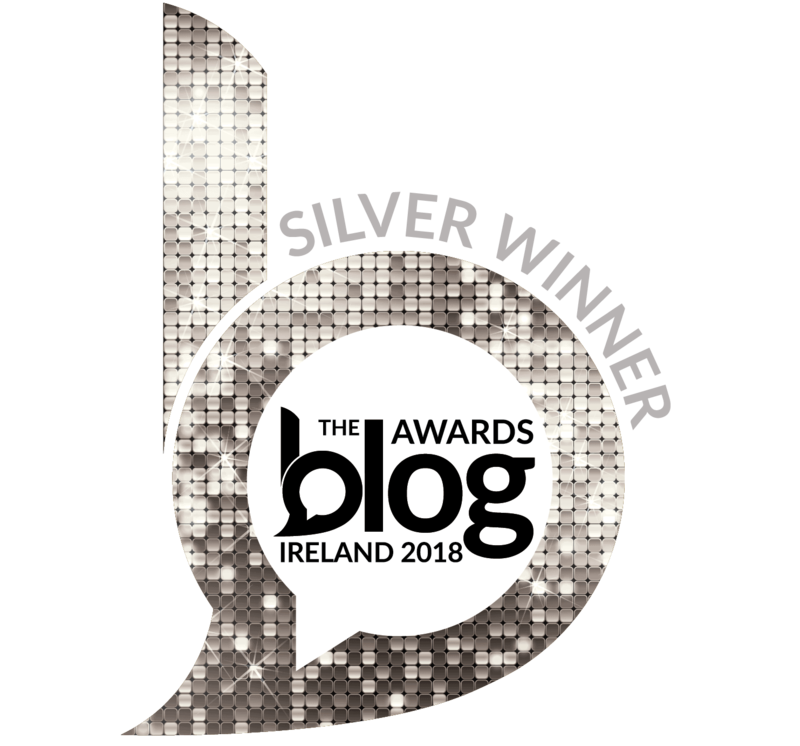 Next prepare the sheet pan or baking sheet as we say in Ireland. 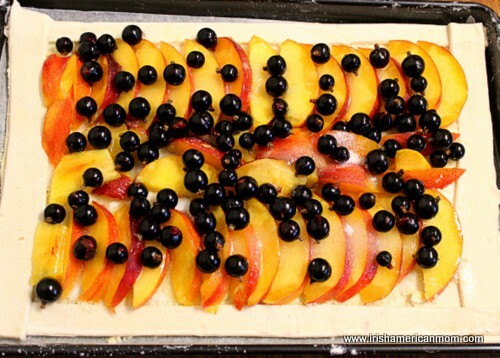 Use parchment paper to line a 13″ x 9″ sheet pan. If you only own a larger pan it will work just fine, since the puff pastry doesn’t have to lay right up against the sides of the pan. Lay the sheet of thawed pastry on a lightly floured surface. Cut a 1 inch strip from all four edges. 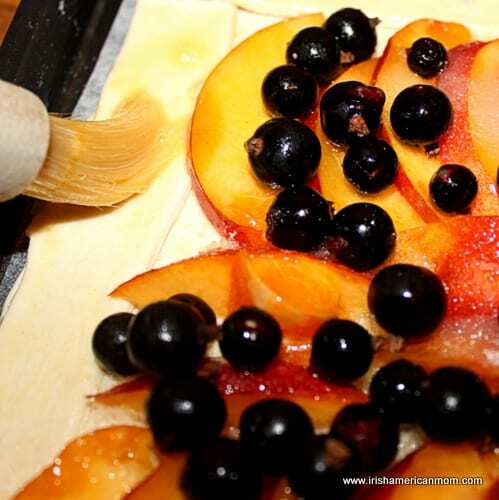 Brush the outer edges of the pastry sheet with egg wash and lay the strips of pastry over the edges to create a frame. Remove excess pieces so that there is only one layer of pastry forming the frame at the corners. Lightly prick the base of the galette with a fork to prevent it from bubbling up while cooking. 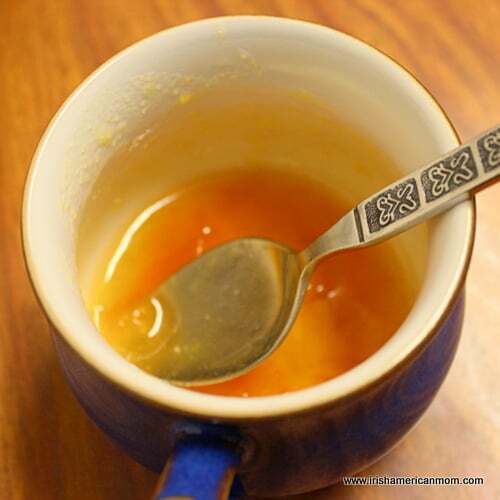 Brush the melted butter over the base and sprinkle it with the ground almonds. Keep the almonds within the frame. Halve the nectarines and remove the inner stone. Slice them evenly then toss the pieces in lemon juice. 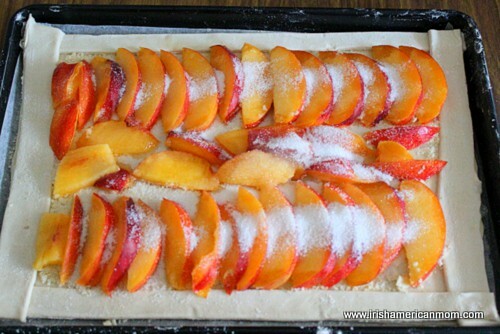 Lay the nectarine pieces over the galette. I like to place them in two even lines at the top and bottom of the tart, and them fill the center with the extra pieces. 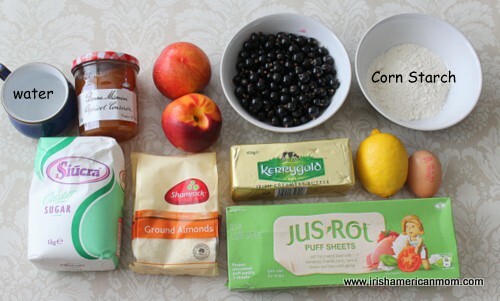 Mix the sugar and corn starch together and sprinkle over the nectarines. Spread the blackcurrants over the nectarines. Blueberries are absolutely delicious in this dessert. The end product is far sweeter than when using tart blackcurrants. 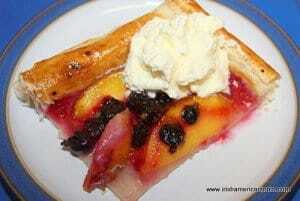 If you like a sweeter galette when using blackcurrants, feel free to use an additional few tablespoons of sugar. Brush the edges or the frame of the galette with the egg wash. This will create a lovely golden crust. Bake the tart in the pre-heated 400° F oven for 25 minutes. If the edges start to brown too quickly, cover them with an aluminum foil tent. Just before the galette is cooked prepare the glaze by microwaving the apricot jam with a dash of boiling water for about 20 seconds. Mix it together well. Remove the cooked tart from the oven. Brush the top of the fruit with the jam glaze. This creates a lovely, appetizing sheen on the fruit. This galette is delicious served cold, or I like it when it is just a little bit warm with a big a dollop of cream or ice cream. 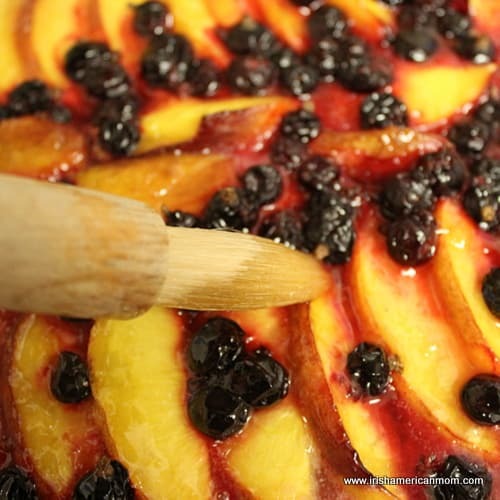 Nectarine and blackcurrant galette is an open, free-form, rustic tart, and is a perfect way to use display the beautiful fruits of summer in a totally delicious way. Step 1 Defrost the puff pastry sheet per package instructions. Step 2 Line a 13" x 9" sheet pan with parchment paper and pre-heat the oven to 400° F.
Step 3 Lay the sheet of thawed pastry on a lightly floured surface. Cut a 1 inch strip from all four edges. Step 4 Place the large puff pastry piece on the parchment lined sheet pan. Prick it lightly with a fork. Brush a one inch strip along the edge of the pastry with egg wash. Place the strips of pastry over the edges to create a frame, cutting away any excess. Step 5 Brush the base of the galette with melted butter. Sprinkle the ground almonds over the base of the galette, making sure not to cover the pastry edges. Step 6 Slice the nectarines evenly, removing the inner stone. Sprinkle the nectarines with lemon juice, then layer them over the almonds. Step 7 Mix the corn starch with the sugar and sprinkle over the nectarines. 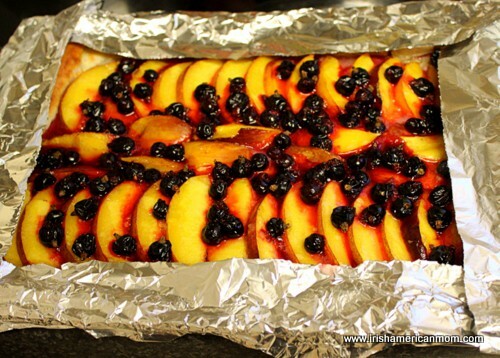 Spread the blackcurrants evenly over the nectarines. Step 8 Refrigerate for 10 to 15 minutes before cooking. Step 9 Bake for 25 minutes. Cover the pastry edges with an aluminum foil tent if the pastry is browning too quickly. Step 10 Heat the apricot jam and a splash of boiling water in the microwave for about 20 seconds. Mix well and then brush over the top of the cooked galette. Step 11 Cool before slicing. Serve with fresh whipped cream or ice cream. Why are black currants so hard to find in the US? Debra – Not all states allow blackcurrants to be grown. Apparently the bushes can be carriers of a fungus lethal to pine trees. Identified as a threat to the vital logging industry in the U.S., growing of blackcurrants, red currants and goose berries was simply outlawed in 1911. It is only in the past few years that some of these bans have been lifted. Blackcurrants are very healthy berries, so perhaps they will become more widely available in the coming years. You are simply a wealth of knowledge, Mairead. Thanks for the explanation as well as the great recipe! You’re welcome, Debra. 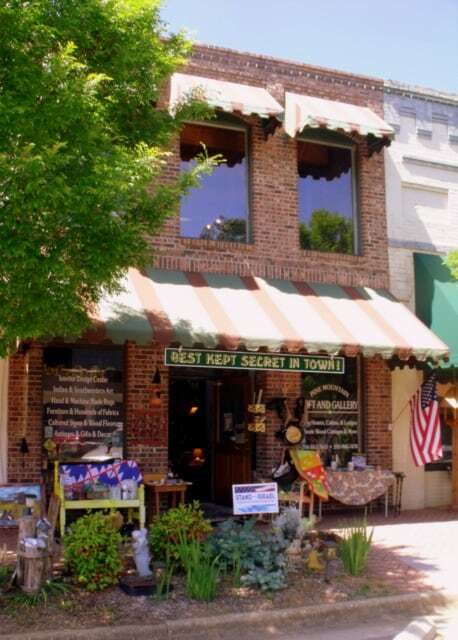 It’s amazing how many little tidbits of information I’ve discovered since I started writing this blog. The internet is amazing. Mairead…darn, I never ordered that black current bush I’d planned on adding to the property (as per your last summer’s post). I wonder if blueberries would work as a substitute… most likely not tart enough. The neighbor gave us a “peach” tree which turned out to be a nectarine, complete with peach leaf curl. I have made puff pastry from scratch and used it to make blueberry tarts for visiting friends. Re: black currants, I was successful (the second time around) with a gooseberry pie. When you research gooseberries, there are several recipes for for them, but not a one references when one can tell if the gooseberries are RIPE. Further research informed me gooseberries are mature when the fruit gives when you pinch it. The taste then is sweet and sour. My second pie attempt: edible but a tad heavy on the ginger. My brother gifted me with two goji berry plants. I’d never heard of the fruit. Maybe I could substitue those for the black currants (until I plant a bush of my own)? T.M. – You could definitely use blueberries and cut back a little on the sugar. They won’t have that perfect tart tang to accompany the nectarines, but for many the tartness of a blackcurrant can be overwhelming. My father loved this galette last year. The tart flavor of the blackcurrants really suited his palate. Sugar was a limited commodity during the 1940’s, so the baking of his childhood was never overly sweet. I often wonder what my granny would think of how much sugar we use nowadays and how we’re creating such sweet toothed children. Anyway, I digress. Back to the galette. I have no idea how goji berries would work instead of the blackcurrants, but my motto is “you’ll never know until you try”. My cousin in Dublin grew the most delicious gooseberries when I was a little girl. We tested them by squeezing them between our fingers. If hard they’re unripe. If they squish and burst they are overripe. When perfect they are slightly springy. The big problem was getting to the gooseberries before the birds, or trying to pick them without knocking over the protective netting. 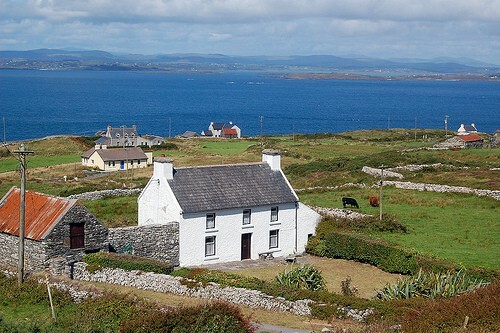 Next time I’m in Ireland over the summer I must find a gooseberry bush to take some photos. Mairead, interesting information about the gooseberries, especially the “ripeness” test. I have two different varieties. One produces smaller fruit and seems to be tarter than the larger (which is also the larger bush). The second variety has larger berries, some nearly the diameter of a nickel, helpful when my pie recipe calls for five cups of fruit. My pie was made from the former variety…smaller fruit, more picking, more time…. I was so pleased with the product this time, I picked five cups from the second variety, cooked the filling, and froze it in a gallon zip-loc bag for a summer’s pie this winter. Birds and gooseberries?? I’ve often joked that even a goose wouldn’t eat a gooseberry. I have yet to see any avian near my bushes. (However, I have a garter snake that has taken up residence in them this summer.) Now the blueberries, black raspberries, pie cherries are a different matter: I have to cover them with netting or all the fruit would disappear in one big robin belch. T.M. – The gooseberries I remember in Ireland must have been similar to your second larger bush. The gooseberries of my childhood were easily nickel size in diameter. When ripe they were just nicely sweet. T.M. 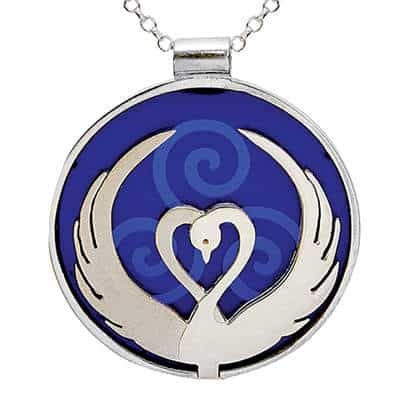 – I love your posts and thoughtful insights into life in the American northwest. Even though your blog is on hiatus, your archives are a treasure trove for readers like me. 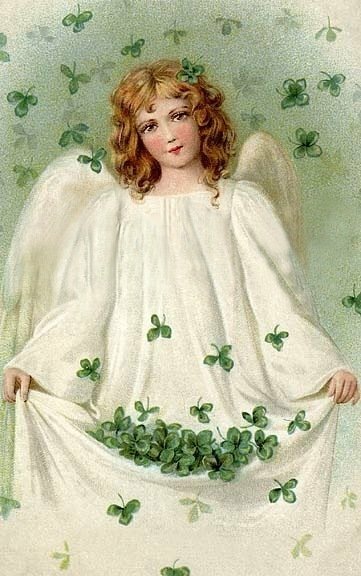 Thank you too for checking out my ramblings, and joining in our discussions about all things Irish and Irish American. Looks delicious – I’ll have to try it with blueberries. 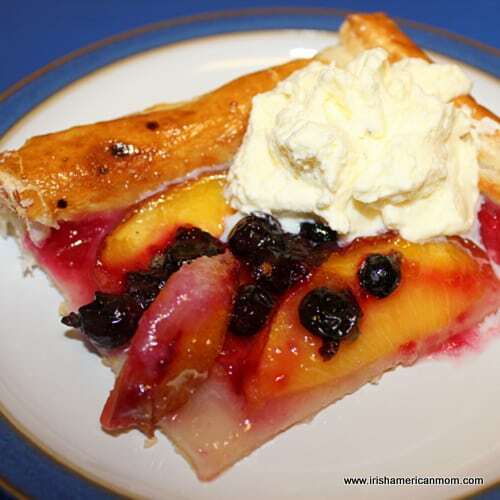 Mags – Blueberries are delicious with nectarines on this tart. Hope you enjoy it. Mairead, I too love puff pastry. Make my own sometimes, but often use storebought. I do wish blackcurrants (and redcurrants) were readily available, and affordable, in the US; but blueberries are wonderful with nectarines. And your tart looks sooooo good! Hi Jean – Puff pastry ready to go is such a life saver. 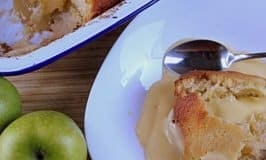 So easy to whip up something fancy or rustic in double quick time. I love to make apple turnovers when I know I need something quick and easy to go with a cup of tea.